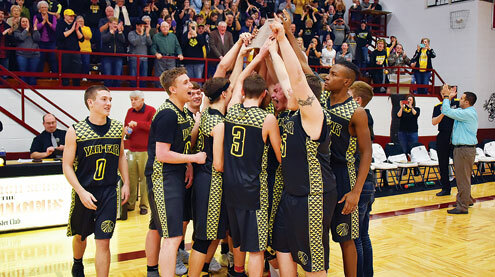 The Van-Far Indians packed top-seeded Canton’s home court with fans and battled their way to a 67-64 district championship in the Class 2 District 6 tournament on Saturday, Feb. 24. Van-Far had a tough week with an opening round win over Clopton and managed to hold off Louisiana in the semifinal. Canton had a relatively easier week leading up to the title game. Canton got on the board first, but the Indians battled back to take the lead near the end of the first before a buzzer-beating shot by Canton’s Lance Logsdon ended the opening frame with the teams tied at 18 each. Trey Miller knocked down a pair of buckets and free throws while Caden Wilburn and Josh Hodde each put five points on the board and Brayden Christian had a bucket in the first quarter. The lead changed a couple of times in the second quarter as Van-Far got baskets from Lathyn McMorris, Christian, and Miller, as well as four more points from Hodde. The Indians took the lead by halftime, 29-27. Canton was able to tie the score a few times in the third, but Van-Far held on to the advantage by the end of the frame. The Indians rained down three-pointers in the third, picking one up from McMorris and Christian and two from Hodde. With a lead of 48-41 going into the final stanza, Van-Far didn’t even need a single field goal to close out the win. The Indians got it done at the free throw line. Van-Far was 11-19 at the charity stripe going into the fourth quarter and ended the game 30-48. The Indians were 19-23 in the fourth frame. McMorris was 6-8 in the fourth, Miller was 5-6 and Christian was 6-7 including a pair to seal the win with under a minute to go. Miller finished the game with 16 points including a 10-14 night at the free throw line. Hodde provided a spark throughout the game and led the way with 17 points. They were named the Community State Bank TribCast Co-Players of the Game. Both spoke to TribCast following the exciting victory and noted the team is working well together and has a goal of getting to the state Final Four. Coach Pat Connaway noted that it was very special to beat a team on their home court for the district title while also filling their gym with more fans. He gave it up to the Indian Nation who came out to support the boys. Also scoring for Van-Far in the championship game: Christian ended the night with 13 points and McMorris scored 12, Wilburn notched seven points and Verylyn Johnson had two. The Indians took down Louisiana in the semifinal 47-50. Hodde led the way with 18 points, Wilburn scored 10, Miller had nine, McMorris notched seven (all from the free throw line) and Christian ended the night with six points. The Indians took down Clopton in the opening round, 68-57. McMorris cracked off 28 points in the win, Hodde and Miller each scored 12 points, Wilburn contributed six points, Christian had five, Johnson notched three and Collin Wilburn scored two points in the victory. The Indians will take on Elsberry in the state sectional on Wednesday, Feb. 28 at Hannibal High School. Elsberry was one of only three losses Van-Far has on the season. All three losses came when the team was without McMorris. Since Lathyn has returned to the lineup the Indians have not lost a game.